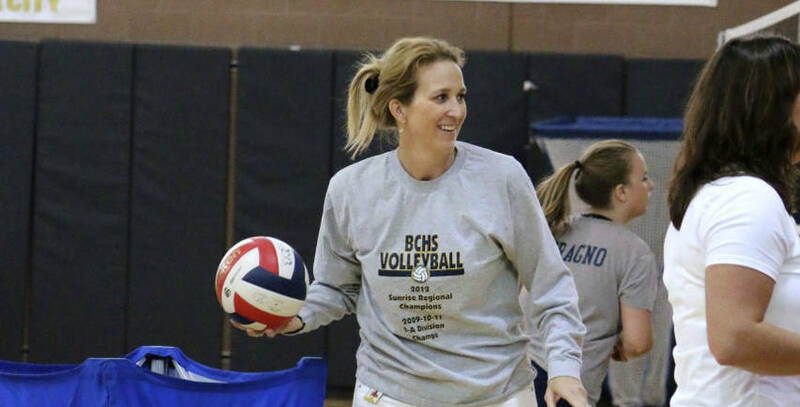 Finishing 3-6 in the 4A-laden Las Vegas Invitational over the weekend, Boulder City High School volleyball coach Cherise Hinman likes the makeup of her team early into the season. File Lady Eagles head volleyball coach Cherise Hinman sees promise for success this season. An improved performance at the Las Vegas Invitational and a final win gave the team momentum moving into its league opener. Playing back-to-back against nine higher-classed opponents Friday and Saturday, the Lady Eagles started off strong with a pair of 2-1 victories against Foothill and Rancho before running into perennial state power Shadow Ridge and losing 0-2. Coming from behind to knock off consistent 4A playoff contender Foothill, which is currently 9-2 on the season, in dramatic fashion 15-25, 26-24, 18-16, the Lady Eagles picked up a signature victory that they can use for momentum heading into league play. Senior Maggie Roe, with her best performance to date, led the way offensively with 19 kills, as well as defensively with 11 digs and four blocked shots. Teaming with freshman Kamry Bailey (seven digs, five kills, three serving aces and one block) and Ava Wright (22 assists, three serving aces, two digs and one block), the Lady Eagles were able to overcome the experienced Falcons. Playing her game strongly in a comeback victory over Rancho 25-27, 25-16, 15-13, Wright tied for the team lead with 11 assists, while adding five digs and two serving aces. Bringing a more all-around attack against the Rams, Roe led the way with 11 kills and assists, seven digs and two blocks, while Bailey added seven kills and sophomore Ellie Ramsey added four kills. Strong defensively against the Rams, Bailey added 10 digs. Junior Ashleigh Wood added six digs, while sophomore Raegan Herr and junior Setia Cox added three and two blocks, respectively. Concluding the Las Vegas Invitational on a high note with a 2-0 win against California program Chatsworth in their weekend finale 25-19, 25-19, Roe led the way with seven kills, four blocks, assists and digs apiece. Bailey (eight kills and seven digs), Wright (14 assists, three serving aces and two digs) and senior Jerra Hinson (three kills, one assist, block and serving ace) also had strong performances. Ashleigh Wood and freshman Maddie Wood added four digs apiece against Chatsworth. Gaining momentum heading into the week, the Lady Eagles will host 4A Las Vegas at 5 p.m. Friday, followed by a road game Tuesday at 4A Basic. Results from the Lady Eagles’ league opener against Chaparral on Wednesday will appear in next week’s issue.